Vac In Line makes the most economical pneumatic conveying system, dust extractor, fume extractor, air amplifiers for cooling. Portable conveyor can be created within minimum time without any modifications to existing system or any shut down of processes. 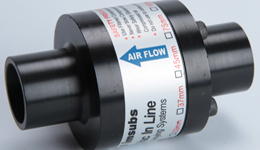 Powered by filtered compressed air, has instantaneous response and infinite flow rate control by regulating compressed air pressure. Again no moving part ensures zero maintenance. Safety, as no electricity at the point of application. Available is Hard Anodized aluminum and SS 304 construction. Available in different throat diameters ffrom 20 mm to 150 mm. Special construction materials available on request (Like Titanium, SS 316, Brass, Cast iron, plastic etc). Can be used to convey plastic granules. Chips, saw dust, stone dust convey. Tablets, capsules, small plastic molded parts transfer. Extracting fumes & dust etc. Aluminum is suitable for general purpose application and experimenters. Stainless Steel is best suited for demanding abrasive and corrosive application and food contact applications.